The next XTV generation is here. High-performance 30HP Twin EFI Liquid Cooled or 40HP Twin EFI Fan Cooled engines deliver clean, dependable power for your Aurora in all seasons. New for 2019 is the Admiral with ARGO Progressive Steering (APS). ARGO Progressive Steering is an innovation in the area of braking force application to the transmission steering differential. By adding a spring element between the handlebars and the brake system we have achieved a progressive, dual-rate steering system. This development combined with the Admiral transmission is a technological milestone giving the ultimate driver experience. 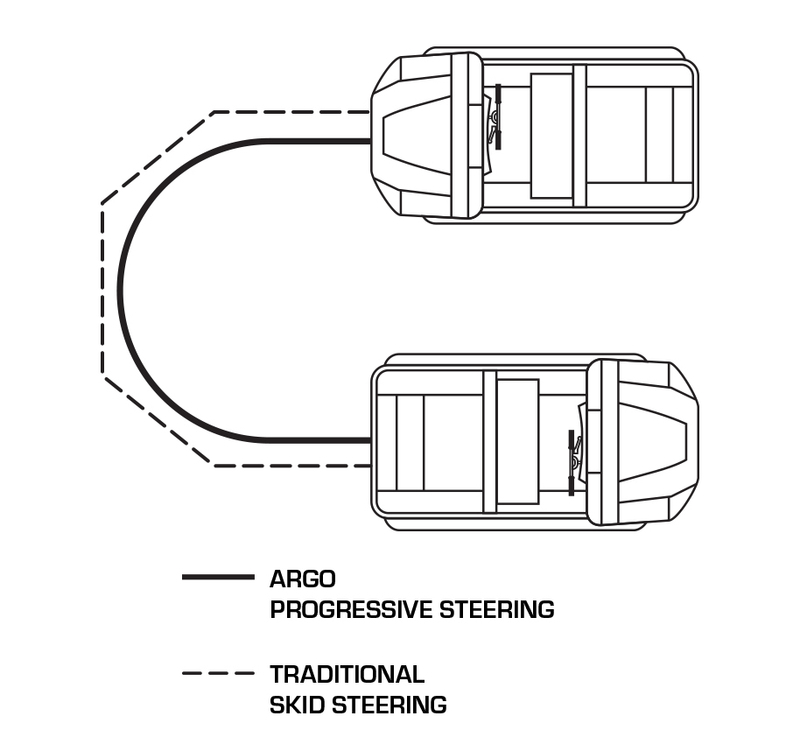 Steering events are now effortless and confidence inspiring, offering the smoothest turning available in an ARGO vehicle. Now an ARGO is as fun and comfortable to drive as any UTV. APS is only available on all-new Aurora models. Equipped with either Steel Offset, Steel Bead Lock or Aluminum Bead Lock Rims with low-pressure 25” tires are custom engineered with a paddle design for amphibious propulsion through water and optimized traction for the most extreme off-road terrain. APS is an innovation in the area of braking force application to the transmission steering differential. The all-new Aurora is as fun and comfortable to drive as any UTV. Upper Photo: By adding a spring element between the handlebars and the brake system we achieved a progressive, dual-rate steering system. Pulling power for when you need it most. ARGO’s Warn winch mounts on the front to assist with high-angle extractions of equipment or debris. Available for each Aurora model as an genuine ARGO accessory with 3,500 lb. capacity. THE AURORA FEATURES AN IMPRESSIVE LIST OF NEW INNOVATIONS. A higher level of fit and finish with automotive-style latching hood. Left-hand steering with over 20% more room in the cockpit. Ease of entry and better ergonomics with integrated anti-slip mats. Reduces sound levels and heat for front riders. New front and second-row bench seating adds increased comfort for four passengers. A smoother ride, lower noise generation and improved traction. Steel or aluminum bead lock rims allow for lower tire pressure which provides 30% smoother ride. Left-hand handlebar controls for starting, headlights and stop switch. Apply hand brake lever and the Aurora will start in gear. Sleek automotive-quality gauges capture high-performance indicators. Dual high/low projector-style head lamps and LED rear tail lights. Now located higher in the middle of the dash for easy accessibility.